Despite that high price tag, this is a worthy update of what is arguably Ensembles most interesting game. Three trolls, four golden battle boars and a pack of wolves have just devastated the last of Thor's town centres, and my gatherers have already moved in to take over their farming network. I am Odin, and my asshat of a thunder god son had the audacity to attack me during the opening 30 minutes of this random map skirmish. This is my petty revenge against Age of Mythology's AI, to send in every single powerful unit I have at the risk of an army of pink centaurs raiding my two settlements from the North while I'm gone. 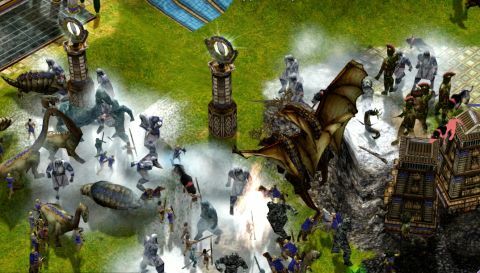 The ludicrousness of this scenario, as mythical creatures of various origins trundle in over peaceful farmland to murder everyone in sight, was Mythology's strength over Ensemble's Age of Empires II: The Age of Kings when it was released in 2002. Mythology's colourful range of high-level fantasy creatures make the final act of any skirmish much more exciting than units of historical repute did in Age of Kings. Kraken trouble the seas, dragon-like nidhoggs circle the skies and hydra grow a head for every enemy they slay. It's still a heck of a spectacle considering it's over a decade old, but I'm not sure whether revisiting this with enhanced visual effects and Workshop support is worth the Extended Edition's steep $30/£23 price. Age of Mythology does feel antiquated, but it is still a lot of fun. It wasn't a notably innovative RTS at release, mostly built on '90s ideas, but it did take Ensemble's blend of Civ-style city management and more conventional military RTS ideas to its creative peak, as well as making the series fully 3D for the first time. This is roughly the same deal as Empires—gather food and other necessary resources, build up a base, advance through the four main tech tiers then accumulate an army big enough to vanquish the other players. The main difference between this and Age of Kings is each advancement to a new age presents a binary choice of gods to take your civilisation forwards, determining unit perks and which of the one-off god powers you can invoke in battle (casting lightning, creating regenerating springs, portals, even an earthquake that can destroy cities—there's a fair few). All the best parts of Mythology are the ways in which it's weirder or more exaggerated than Age of Kings. I love how set pieces escalate from looking vaguely Empires-esque to more like a scattershot fantasy painting with the arrival of these sometimes huge fictional creatures. The upgraded effects of the Extended Edition, most noticeably the shiny-looking water, help contemporise Mythology, but the character models are the strongest signs that this is a decade-old game. AI is a bit of an issue, too. On a moderate difficulty, the enemies attack predictably in medium-sized waves while rarely putting up an overwhelming defence of their own territories. It was made in 2003, and I wasn't expecting this stuff to be rectified, but it's still worth noting if you're going into this for the first time expecting SupCom-level opposition. I don't hold that against Mythology, though, because it is still cathartic to steamroll the AI on random maps. The online multiplayer, too, means you won't be short on smarter opponents, and at launch it seems to be running well, even if the process of finding a game you can join feels a bit arduous. Some online players favour the 'attack early' strategy, which, while effective, means you can wind up out of the running way before the interesting stuff actually happens. Those first ten minutes or so are crucial in resources gathering—there's no room to fall behind or your town centre could be in ruins before you even hit the Mythic Age. The Extended Edition isn't short on single-player content, either. Collected here are the Titans expansion and the shorter Golden Gift DLC campaign, in addition to the original's mammoth story mode. Ensemble went in a different direction to Age Of Kings' truncated array of mini-history campaigns for one surprisingly long affair that snakes its way through Greek, Norse and Egyptian elements of mythology. It's a good way to learn how the paper-rock-scissors countering of unit types work, teaching you that overloading on any one unit type is inadvisable with so many variable strengths and weaknesses in cavalry, archers and warriors. You're still very likely to come out on top in most battles if you raid an enemy city with 15 towering colossi, but countering at least provides another element of strategy to be mindful of. Each campaign level is prefaced by in-engine cutscenes of hilariously low production values. Voice acting sounds like the product of three almost-drunk friends being handed the keys to a recording studio for an afternoon. This shortfall is probably another sign of its age and the industry standard of the time, but otherwise I think this is one of the better RTS campaigns of its day in the variety of the mission structure. You rarely feel like you're doing the exact same thing twice, and the parameters can change from survival to deathmatches and surprise ambushes. The impressively in-depth Scenario Editor helps to extend the singleplayer's lifespan, and with Workshop support, there's no fear of running dry of stuff to do. Age of Mythology still has a lot of value beyond nostalgia, then, but I'd wait for a discount before committing your cash, especially if you already bought it a decade ago. This isn't a total remake, so don't go in expecting one. The Extended Edition is still a really well-paced and entertaining RTS, one that revels in over-the-top imagery and remains a one-off in subject matter within the oeuvre of the sadly departed Ensemble.